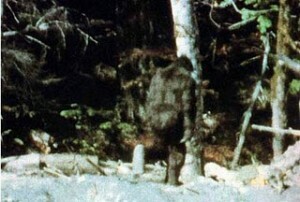 Bigfoot sightings are not only experienced here in the states but have actually been documented across the world. Canada, European countries, Parts of Asia, and several other locations worldwide. The Yeti along with the Abominable Snow Man are both names that reference a beast that resembles our own Bigfoot/Sasquatch; however, in differing regions of the planet, the ape like beast has countless indigenous names depending on its location. Grayson County, Virginia – March, 2010 – 9:30 p.m.
A married couple, along with another woman and kid, were traveling north on Rte. 89 in Grayson County, Virginia when these individuals observed the creature. The creature disappeared when he noticed them. They describe him to the police as having a black hairy body and around seven feet tall. A person coming back from Grants Pass, heading for Eureka, CA, just prior to dark came across a massive, dark colored animal traversing the road. He walked upright, very quickly, and on two legs. The being’s face was human with caveman like characteristics. It was covered in dark colored hair, hefty in build, and also over nine feet in height. Weird creature spotted in the midst of boggy lands, called Turner Triangle in Androscoggin County, Maine. No description was given. A couple of friends were fishing in Picayune Strand State woods. They were walking down a trail and were brought up short when an ape stepped out from the woods. They said they spotted the animal before he noticed them. They backed away slowly, looked back, and saw the animal observing them from behind a tree. The animal posed no threat and appeared just as curious about them as they were about him. No reference to height or physical appearance was presented. Bexar County, Texas – December 1, 2009 – 6:30 a.m. Responding to a 911 call, a law official went to the area the caller described. It was a wooded area with a few sub-divisions and shopping malls. Four tracks were found in the area, about thirteen and a half inches long and depressed deeply into the ground. Pictures were taken to verify prints found. Escambia County, Florida – November 21st and 15th, 2010 – 6:00 a.m. Individual was out hunting squirrels in Escambia County and began to walk into the woods. While walking, this individual heard a low, guttural sound, almost like a Native American dialect. He heard this sound for about ten to fifteen seconds, and then heard it again a little later. On the 25th, He returned with his oldest daughter; again, to hunt squirrels. While in the area, they both heard someone walking. They said it sounded like another man. Webster County, West Virginia – October 27, 2010 – 1 a.m. Wooded area – A man and woman were awoken by an incredibly robust foul, sour milk like odor. Potent enough to prevent them from going back to slumber. The female said she observed a massive shadow walking throughout the patio, blocking out the patio light. Every one of these Bigfoot encounters were reported to interested parties and investigated. A potent foul scent, similar to sour milk or sulfur, entire body covered in dark-colored hair, seven to nine feet in height, bipedal, massive footprints, and ape-like characteristics were the most typical descriptions of the beast. Bigfoot sightings are commonly encountered on roadways and by waterways. Virtually all Bigfoot sightings are unintentional. A considerable number of Bigfoot sightings take place during the night, it is theorized Bigfoot is nocturnal. With all these Bigfoot, yeti, Sasquatch etc… sightings, are all these “creatures” the same animal? no one will believe me when i say that i saw bigfoot today in my backyard in the woods it was a creature that stood with its back erect and walked that of similarity to a human man but not exactly and it swayed its arms back and forth. it was covered in black hair and had a yellowish kind of beard. it had to of at least been a little more than seven feet tall i am only 14 and saw him the thing is i dont want it to come back or go near other people in the neighborhood. i do not wish to encounter this monster anymore but it did not see me but i saw him while i was sitting on my deck or porch the only question is now is what will it do next what is he doing now and where is he now and where is he going? i too believe in bigfoot. in fact, im doing a bigfoot presentation for school on monday. its very interesting, cody, please send me a picture as well! I to seen the beast. I was hunting deer one afternoon when a large ape-like beast emerged from the brush. I was being as quiet as I could but it smelled me and run off. I haven’t been hunting again!! you are crazy!!!!!!!!!!!!!!!!!!!!!!!!!!!!!!!!!!!!!!!!!!!!! p.s. Awesome dude. Hello everyone, typically where do most of all these bigfoots sightings are seen in the world? Oregon or anywhere in the Northwest. Those seem to be the MOST common places for Bigfoot sightings. My father and I are planning a trip to a location where we think we will have a chance of at least a little bit of action. We have yet to pinpoint where we will be camped but we are going to do this eventually. But seriously if you want some Bigfoot action, just head on over to the Northwest. Yakima, Sierra mountains, Mt. Hood, Bend Or. Any places that are in the Northwest with a low number of population. I want to believe in Bigfoot, but there is not one credible evidence of its existence. Anyone can just say they saw Bigfoot walking around and all that, but heck, I can also say I saw bigfoot at the park the other day. Seriously, I only believe what I see..
Bigfoot was also found in India.The footprint of the adult male measures 29 inches and the female size is 26 inches. There are just way too many sightings reported for Bigfoot to be a hoax. Granted, a lot of what has been seen after the Patterson film could be considered unreliable, but when reports of sightings go back to Native American tribes in the 1800s and early 1900s, then you have to at least consider it a possibility that there’s something out there. There are always the “jokes” when this subject is discussed. But, I can tell you I really saw a sasquatch in 1980 in Southeast Alabama. We were turning around in a car and the headlights caught it. The creature stood still and we watched it fro 2-3 minutes. It had huge eyes. It still terrifies me. We blinked the highbeam lights on and off and the creature jumped towards the woods with tremendous speed and agility. It was over 7 feet tall. Laugh if you want. I don’t know what this thing is or where it comes from. But, it is a real phenomenon. I’ve actual heard sounds just like “bigfoot”. i don’t know if it was or what it was, but i compared them to sounds of bigfoot on the internet, and they sound very similar, but i didn’t record the sound so it kinda was a waste. but i wish i could see it. That would be a very awesome/creepy/scary/cool moment of my life. FOLKS AT A STORE IN nc WAS TALKING ABOUT TWO BIGFOOT SIGHTINGS IN UPPER GEORGIA. ONE WAS A MAN WAS DRIVING DOWN A WOODED ROAD AND HIS TRUCK WAS A FORD F250 DUALLY. HE SAID THAT WHILE DRIVING HE WAS THINKING ABOUT OTHER THINGS WHEN HE HAPPEN TO LOOK UP AND SAW SOMETHING BIG AND BLACK STANDING IN THE ROAD. HE SLAMMED ON HIS BRAKES AND THE TRUCK TURNED SIDEWAYS AND SLIDE UP TO THE THINGS. THE THING STOPPED HIS TRUCK AND THEN WENT TO HOLLERING AND SHAKING HIS TRUCK, BRINGING THE WHEELS OFF THE GROUND. HE SAID THIS WENT ON FOR A FEW MINUTES AND THEN IT STOPPED AND WALKED AWAY TO THE EDGE OF THE WOODS AND TURNED AROUND AND GAVE HIM A MAD LOOK AND HOLLERED AT HIM AGAIN. HE SAID THIS THING STOOD AT LEAST SEVEN TO EIGHT FEET, BLACK AND HARRY WITH A MAN LIKE FACE. ANOTHER OLDER MAN WAS SITTING IN HIS YARD SWING AND SAW SOMETHING BIG, BLACK AND HAIRY WALKING UP RIGHT DOWN HIS DRIVE WAY. HE WATCHED IT FOR SEVERAL MINUTES AND THEN IT TURNED OFF HIS DRIVE AND WENT INTO THE WOODS. LATER ON HE WENT AND FOUND PRINTS AND MADE SOME CASTS OF THE FOOT PRINT. THERE HAVE BEEN MANY SIGHTINGS IN WESTERN NC AND UPPER GEORGIA AND IT SEEMS THEY ARE COMING MORE AND MORE. A ELDERLY CHEROKEE LADY STATED THAT THERE ARE STILL PLACES IN THE MOUNTAINS OF WESTERN NC THAT NO MAN HAS EVER WALKED AND THERE IS NO TELLING WHAT LIVES THERE. The world is being taken over by these dam dirty apes! In 1975 we live in mt, one day my 2 son’s 4 and 2 was out side playing, i ran in the house and i hear a loud noise as i ran out 4 very mean dogs was running away with their tail between the legs. I ask my oldest son what was that ,he said the dogs came after them but a Bigfoot appeared on the side of the mountains, he was on a big rock holding up tree branches and threw them at the dogs. My son said the dogs was trying to get them when we hear the noise. All i got to say is it save my boys from the dogs. I saw a huge cat the other day. It was so big, it ate my dog. I was going to take a picture but then it ran away into the woods with supernatural speed. I wish I could remember more but I got kidnapped by aliens and my memory is fuzzy. Maybe Bigfoot isn’t some mythological creature. Maybe just because we barely sight them, and they live in the woods, that just maybe it’s actual cavemen. I mean, as humans, according to science, we descended from apps anyways. I’m not saying it’s a flooz, I’m simply saying we should really think inside the box instead of blowing things up wondering if there is some unidentified creature living out there. my first sighting was when i was digging for Indian artifacts in a swamp by our house here in central Florida. The creature was about 8ft. tall not knowing when i was walking to my sight i walked right past it only 7 to 8 feet away it blended in with the surroundings so good i did not notice it then when i got to the sight i started digging when the foul odor hit me ! Almost smelled like a skunk and a wet dog a odor i will never ever forget!!!! I got to see the creature get up on 2 legs and walk away from me at this time it is 25yards from me i freaked out pretty bad i have seen and been around a lot of animals in the swamp but this was not the last time i would see the creatures,yes i have seen as many as 4 at one time, i have had people with me and they too have seen them,they are nomads we see them they dont stay in one area long but when i do see them they are usually only a few yards away!!! And let me tell you this is some cool stuff!!! they are very curious creatures, i dont provoke them in any way so i can keep seeing them when they are in my area.and my friends promised never to take anyone else to my dig sight cause this is a once in a lifetime moment i will ever be able to see something like this and i dont want anyone to ruin it. but in a nut shell ,yes i believe cause i have seen them with my own eyes!And i dont care what people say, i know they are true!!!!!!!!!!!!!!!! Where in fl was this and how long ago? OMG!!!!!!!!!!!!!!!!!!!!!!!!! I SAW THE SQUATCH!!!!!!! IT FREAKING ATE MY FRIEND AND I SAW HIS TRIPLE JOINTED!!!!!!!!!!!!!!!! THEN HE CAME OUT OF THE SUIT!!! i saw Bigfoot two days ago walking around in the woods when i was cutting firewood it was watching me so threw a rock at it and it ran away so i chased it with my ax because it as ugly as my ex girlfriend so i thought it should be dead but i never did see it again so i sat down and drank some beer. My great grandfather saw a Sasquatch.he was watering the plants.when he looked back,he thought he saw a man.the beast was following my great grandpa.when he looked back again,he understood that it was not a man but a beast.He ran in fear.Strange is the Sasquatch ran too!My great grandfather went home fast in fear and he described it a very large ape like man with black hair.